Hashtable is an implementation of a key-value pair data structure in java. You can store and retrieve a ‘value’ using a ‘key’ and it is an identifier of the value stored. It is obvious that the ‘key’ should be unique. java.util.Hashtable extends Dictionary and implements Map. Objects with non-null value can be used as a key or value. Key of the Hashtable must implement hashcode() and equals() methods. By the end of this article you will find out the reason behind this condition.
. Initial capacity is number of buckets created at the time of Hashtable instantiation. Bucket is a logical space of storage for Hashtable. Before seeing java’s Hashtable in detail you should understand hashing in general. Assume that, v is a value to be stored and k is the key used for storage / retrieval, then h is a hash function where v is stored at h(k) of table. To retrieve a value compute h(k) so that you can directly get the position of v. So in a key-value pair table, you need not sequentially scan through the keys to identify a value. h(k) is the hashing function and it is used to find the location to store the corresponding value v. h(k) cannot compute to a indefinite space. Storage allocated for a Hashtable is limited within a program. So, the hasing function h(k) should return a number within that allocated spectrum (logical address space). Java’s hashing uses uses hashCode() method from the key and value objects to compute. Following is the core code from Hashtable where the hashCode ‘h’ is computed. You can see that both key’s and value’s hashCode() method is called. The general contract of hashCode is: Whenever it is invoked on the same object more than once during an execution of a Java application, the hashCode method must consistently return the same integer, provided no information used in equals comparisons on the object is modified. The following is to improve performance of the Hashtable. hashCode() guarantees distinct integers by using the internal address of the object. When we try to restrict the hashing function’s output within the allocated address spectrue limit, there is a possibility of a collision. For two different keys k1 and k2, if we have h(k1) = h(k2), then this is called collision in hashtable. What does this mean, our hashing function directs us store two different values (keys are also different) in the same location. When we have a collision, there are multiple methodologies available to resolve it. To name a few hashtable collision resolution technique, ‘separate chaining’, ‘open addressing’, ‘robin hood hashing’, ‘cuckoo hashing’, etc. Java’s hashtable uses ‘separate chaining’ for collision resolution in Hashtable. Java uses separate chaining for collision resolution. Recall a point that Hashtable stores elements in buckets. In separate chaining, every bucket will store a reference to a linked list. Now assume that you have stored an element in bucket 1. That means, in bucket 1 you will have a reference to a linked list and in that linked list you will have two cells. In those two cells you will have key and its corresponding value. Why do you want to store the key? Because when there is a collision i.e., when two keys results in same hashcode and directs to the same bucket (assume bucket 1) you want to store the second element also in the same bucket. You add this second element to the already created linked list as the adjacent element. Now when you retrieve a value it will compute the hash code and direct you to a bucket which has two elements. You scan those two elements alone sequentially and compare the keys using their equals() method. When the key mathches you get the respective value. Hope you have got the reason behind the condition that your object must have hashCode() and equals() method. Java has a private static class Entry inside Hashtable. It is an implementation of a list and you can see there, it stores both the key and value. initialCapacitiy is the number of buckets to be created at the time of Hashtable instantiation. The number of buckets and probability of collision is inversly proportional. If you have more number of buckets than needed then you have lesser possibility for a collision. For example, if you are going to store 10 elements and if you are going to have initialCapacity as 100 then you will have 100 buckets. You are going to calculate hashCoe() only 10 times with a spectrum of 100 buckets. The possibility of a collision is very very less. But if you are going to supply initialCapacity for the Hashtable as 10, then the possibility of collision is very large. loadFactor decides when to automatically increase the size of the Hashtable. The default size of initialCapacity is 11 and loadFactor is .75 That if the Hashtable is 3/4 th full then the size of the Hashtable is increased. If you give a lesser capacity and loadfactor and often it does the rehash() which will cause you performance issues. Therefore for efficient performance for Hashtable in java, give initialCapacity as 25% extra than you need and loadFactor as 0.75 when you instantiate. Difference between Vector and ArrayList in java? yes Joshi you are right. Between Hashtable and Hashmap, Hashmap is preferred in non-threaded environment. When you are forced to use Hashtable, consider these performance tips. Sure I will come up with an article about Hashtable vs Hashmap. good info. keep posting. can u write some info on the DAO patterns. Kindly start posting on JEE6 features. Great. Clear & Simple. Thank you. It is very nice and clear. Can you take some real time examples and explain (like yellow pages). That would be great!! “Hashtable is preferred in non-threaded environment.” – you mixed it up? ;) – hashtable is the synchronized version, so use hashmap instead, if multi-threading is not needed. And besides – one should always consider the synchronizedXYZ Methods of the Collections class instead of using special synchronized Collection types. So use: Collections.synchronizedMap if you want a synchronized version of HashMap. Oops! Born, thats a typo (very costly one) :0 I have fixed it. Thanks for pointing out. Such a nice article i have ever seen.. Instead of using HashTable, If we use HashMap and put those block in a synchronized block..what you say on performance? @Partha, using HashMap enclosed in a synchronized block is costlier than using a Hashtable. Since, the synchronization in Hashtable is fine-grained than this approach. The best possible approach would be analyze the need for synchronization and avoid using Hashtable. It is very simple language that you used in this blog which makes me very impressive to read a lot of stuff about java from this blog. I am fortunate to take look at this website. Hopefully you will be coming up with better and essential information regarding Java. This is a lucid and nice Article. You can always keep adding the features and extra information. We are also java developers and provide various projects for free. Would you give us an opportunity for a Guest Posting to write about Image Processing in Java? We will wait for your positive response. Nice post…….please try to elaborate it with some examples…. Hey joe the explanation is really excellent you can also post on struts, spring, hibernate. I- two keys are same .But it does not throw any exception. How it finds collision resolution? II- two keys are different .But hascode values are same for two keys. How it finds collision resolution? A line much like this exists (Hashtable.java:948 in jdk 6u23). However, this line is NOT used in the regular business of put() and get(). Rather, it is the hashCode Entry inner class, which must override hashCode() because it overrides equals(). In normal put() and get() operations, the value’s hashCode is never used. (This must be the case, because the value is not known in a get operation.) Look at the get() method on line 332 and note that it only calls key.hashCode(). Thanks for posting this article! Since it’s getting plenty of readership, I wanted to make sure that people don’t get the wrong idea and think that the value’s hashCode plays a role in the put operation. To be honest, calculating hash using both key.hashCode() and value.hashCode() is done in Map.Entry.hashCode(). Hashtable uses _only_ the value of key.hashCode() to find value. It would be quite surprising to use value’s hash for lookups. Which maps par (String, Integer) -> Integer. nice explanation! i was struggling to understand about hash table and hash map.Now i am clear.Thanks a lot.looking for more stuff…. Its pretty good article for Hashtable. I have got more idea about on this. The Explanation is very nice..
Keep on posting more article, best of luck. Please give a same demo for HashMap also. Information is very clear and in simple terminology. Thanks a lot. why null is not allowed in Hastable..?? i want hashcode for long string without collision please. You are awesome… Last thing I am gonna say (Actually the first thing too)..
also pl try to put simple example to construct a hashtable program in java……..
Nice explanation, I’ve one question. Plz give two different Keys which produces a same hashcode? Please write an article on Thread and Comparable/comparator. I like the the way you are explaining every topic. This blog became as one of good references. Thank you for this post. Very useful article for me. can you please provide a full article on java collection framework with example. Also put all Hashing Techniques like Bucket all that. Quick and briefly useful. Thank you for that. 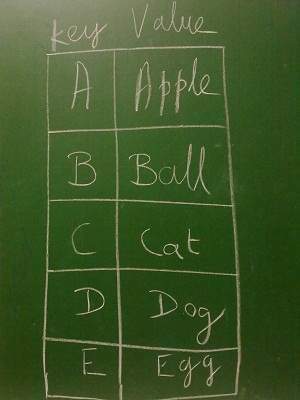 We need easy examples to start with and increase our skills in hashing. Hi Joe,Can you please clarify my doubt about HashTable. Nice article Joe, helps understand the basics very well ! Please provide How will we handle the error code like 500 internal server error in application level ? It is a very nice article, it helped me a lot. But it would be very nice if you explain about how buckets are created and handled in hashtables. can you tell me the formula to calculate “hash function”? Fantastic explanation,You are really Astute person. Simple logic: How will this work when you are doing a search on a hash table. You are just aware of the key and there is no way you will be directed to the right bucket in retrieval. Provide some good Examples for Hashtable.I am able to attend easily. I didn’t get this statement. The collision is purely depends on the symetric objects(Same in hash codes) right? how it is depended on size of bucket? I am fan of you, you are sharing the excellent knowledge from your experience. Thanks a lot for that. I need some help from you that I just want a sample code (any class) which doesn’t override hashcode() method and shows different hashcode number in different context.. Please me give real time ussage of collections..suppose in bank project where we use hash table or hashmap or ArrayList ect..
i didn’t understand completely how the Collision Resolution. 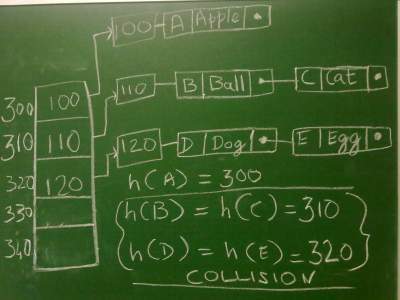 if h(B)=H(C)=310 if same hash code is returned, can you explain how the collision is resolved? didn’t understand completely how the Collision Resolution. if h(B)=H(C)=310 if same hash code is returned, can you explain how the collision is resolved? 1. Hashtable is synchronized, whereas HashMap is not. This makes HashMap better for non-threaded applications, as unsynchronized Objects typically perform better than synchronized ones. 2. Hashtable does not allow null keys or values. HashMap allows one null key and any number of null values. 3. One of HashMap’s subclasses is LinkedHashMap, so in the event that you’d want predictable iteration order (which is insertion order by default), you could easily swap out the HashMap for a LinkedHashMap. This wouldn’t be as easy if you were using Hashtable. Hi can u provide some tutorial also on hsqldb. Basic idea is to generate hashcode uniquely among the object and calculation logic should be simple enough. How is it possible that output is coming “Four” for the key provided as null. can we able to read and write excel(.xls) using hashtable ?? In the first scenario, it overrides the value for the key “abc” from 12 to 13. In the second scenario, it uses key’s equals() method for collision resolution. In which scenario I should use HashTable. Can you please give scenarios for all Collection implementations. i.e., for ArrayList, LinkedList, HashMap, HashTable, HashSet, TreeSet etc. Excellent document …Trying to understand about the hashcode() and Equals() methods contract from long time. Finally got a nice and simple document which gives a clear explanation, thanku. Why Hashtable class does not allow null key and null values? hash value for “null” is zero and HashMap is storing null key (and corresponding value) in the 0th location. why hashtable is not using this ? Is there any specific reason ? Very Nice,Can any one explain the difference between hashtable and hashmap with realtime examples? My question is regarding size of HashMap/HashTable. note: please let me know where exactly(in real time) we are going to use hashtable(with example).. and advantages over It??? Comments are closed for "Java Hashtable".